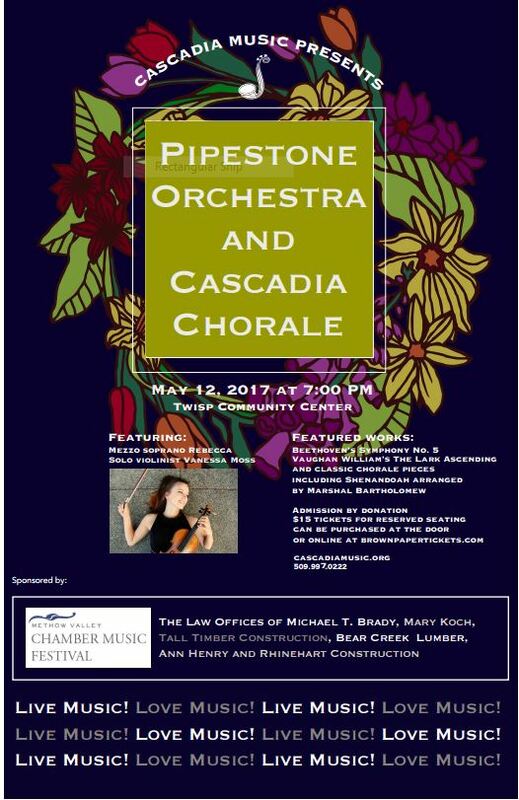 Cascadia Music presents The Pipestone Music Days May 12th and 13th. Music Director Matt Armbrust is very excited about the Pipestone Orchestra concert on Friday, May 12th and has programmed a diverse selection of great works culminating in a complete performance of Beethoven’s Symphony No. 5. Award winning Portland violin soloist Vanessa Moss will be playing The Lark Ascending by Ralph Vaughan Williams and The Methow Valley’s own mezzo-soprano Rebecca Kinney will be accompanied by the Pipestone Orchestra performing the aria Simple Song #3 by internationally renowned contemporary composer David Lang. The Pipestone Brass and Percussion will be featured in Aaron Copland’s classic Fanfare for the Common Man and Armbrust will debut his piece I Have a Dream which was inspired by the legacy of Dr. Martin Luther King Jr and will feature members of the Cascadia Choir. The orchestra will be supported by musicians from the Spokane and Wenatchee symphonies, as well as members of Okanogan Valley Orchestra. On Saturday May 13th Cascadia Music will present several ensembles performing at venues in Winthrop after the 49er’s Day Parade. Look for the schedule of music which will include the Shafer Museum on cascadiamusic.org or call 509-997-0222.